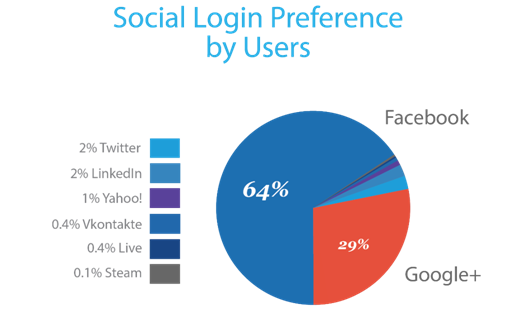 5 reasons your Magento Store needs Social Login – right now! If you’re still on the fence regarding incorporating Social Login for your Magento eCommerce Store, we’re going to give you some very useful insights in this post. You absolutely need social log-in/sign-up enabled on your Magento Store regardless of your consumer demographics! We’ll also tell you how to accomplish social sign-up/log-in on your store – in a jiffy! #1 reason: Your customers want it! 86% of customers dislike creating new accounts on websites. 54% of users said they may actually leave a website and go to another rather than complete an individual registration form. It is worthwhile to note that most online e-Commerce stores offer both, an individual registration form and a Social Login form so as to allow the users to choose what suits them. Giving your users the opportunity to decide, makes perfect business sense. 88% of users admit to entering incomplete or incorrect data on registration forms Do you want to be stuck with that kind of data? We hope not. Not only does Social Login do away with Password fatigue (yes, it’s real) but it also ensures that you get your hands on more than 200 verified data points about the customer, without disturbing or haggling with the user. These data points are vital in understanding the users’ likes, dislikes, shopping trends etc. 74% users report getting frustrated when the website tries to cross-sell and up-sell items that are completely unrelated to them. Data is vital and social login ensures your customers have a positive experience in shopping with you. Social media allows you to connect with your customers and align your products or service offerings with their expectations. There is a wide perception gap that social media allows to address. All you got to do is take to FB or Twitter, and literally ask your users what they want – feedback loops, opinion polls, surveys,and a lot of other tools allow you to do that. Giveaways are a great way of engaging customers to write reviews and share products or purchases on social media. 78% of people share their positive experiences, liked products, wish lists etc., on social media platforms When your existing patrons share their positive experiences on Social Media, it gives you a coveted advantage with the other consumers connected to your patrons! Needless to say, I’d trust a store that my friend frequently buys at and has shared it online. So pick your angel patrons and turn them into evangelists by offering giveaways, vouchers, sale previews, loyalty points, and what not. With all of the above benefits, we’re sure you’re pretty convinced that social media logins could significantly improve your Magento Store. If you’re still sitting on the fence with that decision, we perceive it must concern the developer aspect of the whole process. Drop your worry – Magento Social Login Extension is available at a rock-bottom sale price. Not only is it light on your pocket, it is light on your mind too – easy to setup plug-n-play extension that takes just minutes to setup even if you have two left feet in this race! Rest assured, our tech team is readily available to assist you with the setup! •Announce a $5 Christmas voucher for all new signups using an inexpensive Facebook ad. Magento social login extension for easy login access!